Pilgrimage in honour of St Declan at Ardmore, Co Waterford, can be traced back to the early medieval period. 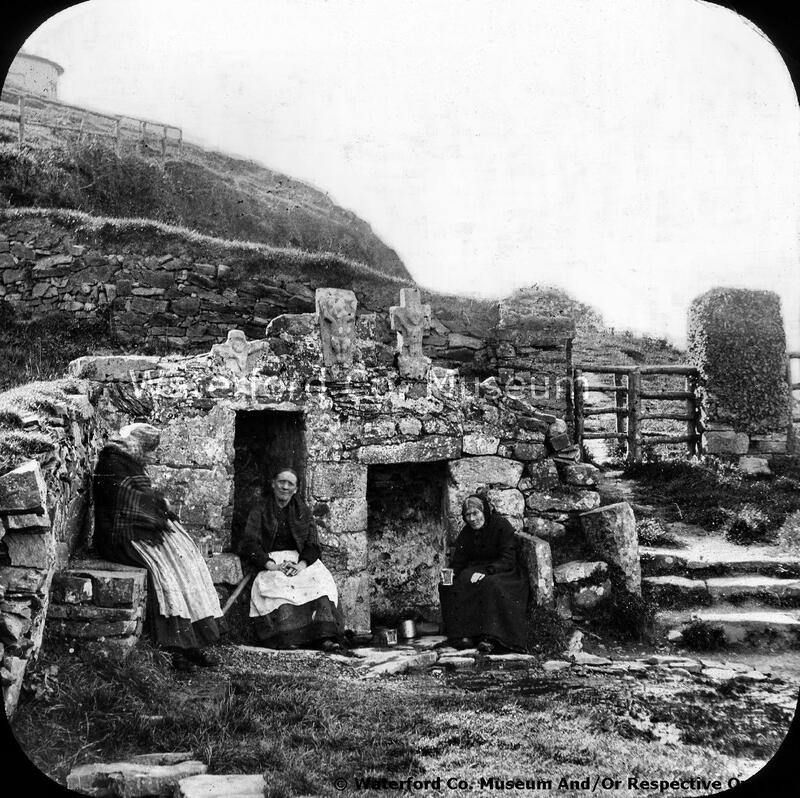 During the nineteenth and early twentieth century, Ardmore was one of the most important pilgrim sites in the southeast of Ireland, attracting 1000’s of pilgrims for the annual pattern day celebrations. Pilgrim rituals during this period have been extensively discussed by Dr Stiofán Ó Cadhla’s in his excellent book The Holy Well Tradition. The Pattern of St Declan, Ardmore County Waterford, 1800-2000. Although the numbers of pilgrims have fallen over the years, the saint and the celebration of his feast day (24th of July) are still a very important part of village life in Ardmore. The nineteenth century pilgrim landscape was quiet extensive and included St Declan’s grave (at the eary medieval monastery), St Declan’s stone and St Declan’s holy well (see map on below). Image taken Google Earth showing location of the St Declan’s grave, St Declan’s stone and St Declan’s Holy Well, nodal points in pilgrim landscape at Ardmore. Today modern devotions are almost exclusively focused on St Declan’s holy well. They include a prayer vigil on St Declan’s eve at the well, along with the traditional rounds on the feast day. During the course of my research I came across a wonderful film on the Ardmore pattern day, which I want to share with you. This short film was created by Horgan Brothers’ films in 1910. The Horgan’s began their careers as photographers and later worked with film, opening a cinema in their home town of Youghal, Co. Cork. It was here they screened their newsreel style short films, which they named the Youghal Gazette many of which can be seen on the Irish Film Institute Website. It is most unusual for an Irish pilgrimage of this period to have been filmed, let alone available to a wide audience today (through the Irish Film Institute). I am very grateful to the Horgan Brothers for their efforts as their work provides a wonderful window into devotional activity in Waterford in the 1900’s. The film opens at St Declan’s holy well the last station in the early modern pilgrimage. There are many accounts which allow us to reconstruct the early modern pilgrimage at Ardmore but to see real pilgrims moving through the landscape is truly fascinating. The photo below shows the location where the Hogan brothers set up their camera. They choose a position that over looked the well and church and also the approach route from the village. As the film opens, directly in front of cameras are a group of six people, engaged, in what can only be described as people watching. Closest to the camera is gentleman in straw boater hat. He watches as people walk along the path to the well and is caught in the embarrassing act of picking his nose. Next to the man, is a lady dressed in a light coloured dress with a parasol. It seems to have been a warm sunny day as many of the ladies present have parasols. The young woman relaxes on the grass after fixing her parasol behind her head to provide some shade. Again her position allows her to comfortably view all who approach and leave. The remaining people in the vicinity of the camera are four ladies standing beside a wall adjacent to the entrance. They are watching the pilgrims complete their rounds and prayers with great interest. At the time pilgrims began their prayers in front of the well. They then walked clockwise around the church and well while reciting three decades of the rosary. They would then knee before the well, finishing the rosary before moving to the well to say more prayers and take the water. The film shows people in different stages of their pilgrimage. A cluster of people are in front of St Declan’s Holy Well, they must have completed their rounds, while the stream of men and women, make a clockwise circuit of the holy well and its adjacent church saying the rosary are only half way through theirs. It’s interesting to note the majority of men have removed their hats during the pilgrimage as a sign of respect for the place and the saint. The landscape of the well has changed little since 1910. Below is a contemporary photo of the front of St Declan’s holy well which is obscured from view in the film. The structure of well has changed little over the years with the exception of the theft of the smallest of three medieval carved crucifix (on the left side of the photo) incorporated into the top of well superstructure. Part of the pilgrim rituals at the holy well involved pilgrims carving crosses into the wall of the church and parts of the well superstructure. These actions are also caught by the camera. This practice is not unique to Ardmore but here as at the other sites, it is unlikely to have begun earlier then the nineteenth century. From the well the film then cuts to St Declans’ Stone, an erratic boulder located at the southern end of the strand some 500m to the east of the holy well. According to tradition the stone carried St Declan’s bell and vestments, floating across the sea from Wales to Ardmore. The stone was used as a penitential station by past pilgrims. In the film we see a woman wearing a Kinsale clock, a traditional garment worn up until the early twentieth century, standing beside the stone. A man wearing a long trench coat can be seem crawling out from under the stone. Traditional devotions at the stone involved the pilgrim saying set prayers before crawling under the rock. Given its located on the shore devotions could only take place when the tide was out. Outside of the pattern day the stone was also visited for healing and was thought to be particularly beneficial for those with backache or rheumatism. The stone was a central part of the pattern day devotions until the mid-twentieth century but pilgrimage has now ceased here. The film then ends abruptly as the woman kneels in prayer and we do not get to see her crawled under the stone but she surely did. I plan to write a more detailed post about the post medieval and medieval pilgrimage rituals at Ardmore in the new year. I will also be discussing the site at an upcoming lecture for the Waterford Historical and Archaeological Society in February of 2019 so please come along if you want to find out more.